lots of family time instead. We have my BinL and his wife staying with us, on their way to Vietnam. 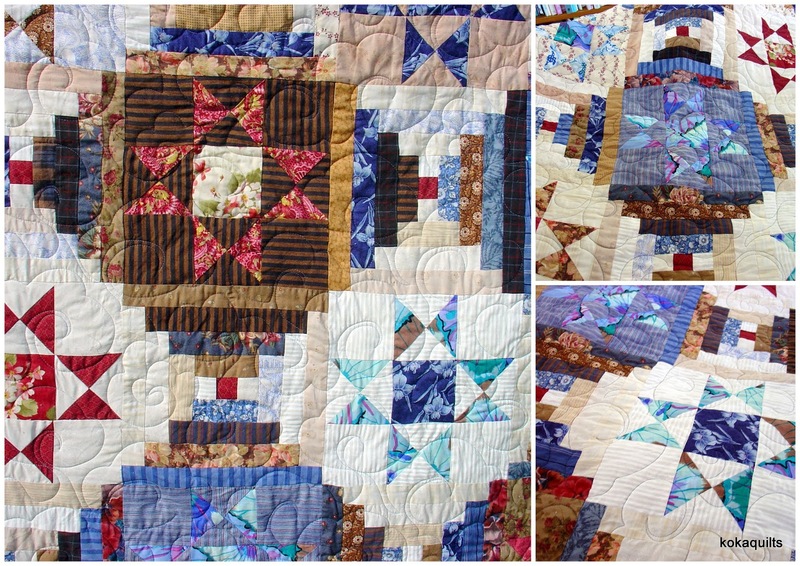 she chose this very old blue & brown quilt, made up of stars & courthouse steps blocks. Are you ready for a quick trip down my scrappy memory lane? with other fabrics available at that time. but I still love, love that Kaffe blue floral I used for the outer border & binding ! I had it machine quilted while I was on holiday down at Waihi a long time ago. And then it sat on the shelf. I'm so glad this old quilt has finally found a home and will be used & loved. Hope you enjoyed this little peek back into my quilty past ! Very effective use of coloiurs, and I love the stars and steps look. So nice it will be loved and used. Yes, certainly enjoyed a viewing of an older quilt of yours. I do like the design Linda, takes me back a while! I still have a little of the blue Kaffe fabric in my stash, I think I have some in orange as well. Sometimes it does take a long time for a quilt to find its forever home. It might be old school but it is pretty! I would say it's classic with an original twist in terms of fabrics - it's so pretty! Nice for the quilt and for your SIL to be matched up! I can see why she chose this one - it's a beautiful nod to traditional quilts. So glad it will be used and loved (by someone else) now. It's a lovely quilt, no wonder your sister in law chose it. Great for you to know one of your quilts will now be used and enjoyed. Don't we all have a quilty past with Kaffe fabrics, mine was combining one of his large floral prints with feedsack and thirties prints. The quilt is over 15 years old and I still love it. So nice that you gave your quilt away. I love the log cabin, Ohio star blocks and then the red, blue, cream and brown make it perfectly classic. Lovely - and it definitely has the feel of your current work too. I’ve always loved the mix of blue and brown. It’s a beautiful quilt and I do recognize your ‘style’! It's beautiful! I'm a big fan of combining Kaffe with *everything*, and this is just perfect! Gorgeous quilt! Your SIL picked well. I am so enjoying reading your blog.. the maverick uses of fabrics, and the way that a traditionally 2 colour or 2 fabric quilt is substituted, in the way of the antique quilts. These really appeal to me. Thank you for sharing your work. Inspiring. bicycles, and boardwalks, and birds oh my!